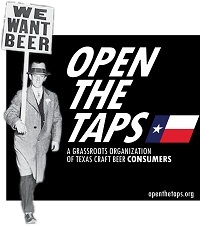 Open The Taps (a grassroots organization dedicated to changing Texas beer laws and regulations) is holding their first fundraiser of 2012 on Sunday, February 12th from 2pm ~ 5pm at Southern Star Brewing in Conroe. • A brewery tour & tasting. • Food from Coreanos Texas Food Truck. • Music from local band Folk Family Revival. • The chance to bid on special items from local breweries and businesses. • 1 raffle ticket (additional raffle tickets will be for sale at the event - $2 per ticket or 3 for $5). The proceeds from the event will help fund their mission to bring change to Texas craft beer laws in the 2013 legislative session. Amazing band. Come to get EarFolked!! !